Gerhard Sommer was born on 14 September 1919 at Steinpleis near Zwickau in Sachsen. Sommer was posted to JG 1 at the end of 1941. Leutnant Sommer was assigned to 3./JG 1. He recorded his first victory on 11 August 1942, when he shot down a RAF Wellington twin-engine bomber near Helgoland. In autumn 1942, Sommer was appointed Staffelkapitän of 1./JG 1. He recorded his first victory over the increasing numbers of USAAF four-engine bombers raiding Germany on 26 February 1943, when he shot down a B-17 near Sengwarden. On 1 April, 1./JG 1 was redesignated 4./JG 11. On 28 July 1943, Sommer shot down two B-17 bombers to record his 10th and 11th victories. By the end of 1943, Sommer had 17 victories to his credit, including at least 12 four-engine bombers. He recorded his 20th victory, a USAAF P-47 fighter shot down near Hannover, on 8 May 1944. On 12 May 1944, Sommer was shot down and killed in Bf 109 G-6 (W.Nr. 140 028) “White 14” near Salzkotten in aerial combat with USAAF P-47 fighters. Hauptmann Sommer was posthumously awarded the Ritterkreuz on 27 July. 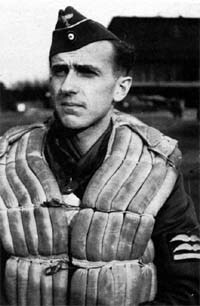 Gerhard Sommer was credited with 20 victories. All his victories were recorded over the Western front and included at least 14 four-engine bombers.